Back on the market! Everything is done and this cute home is ready for a new owner. 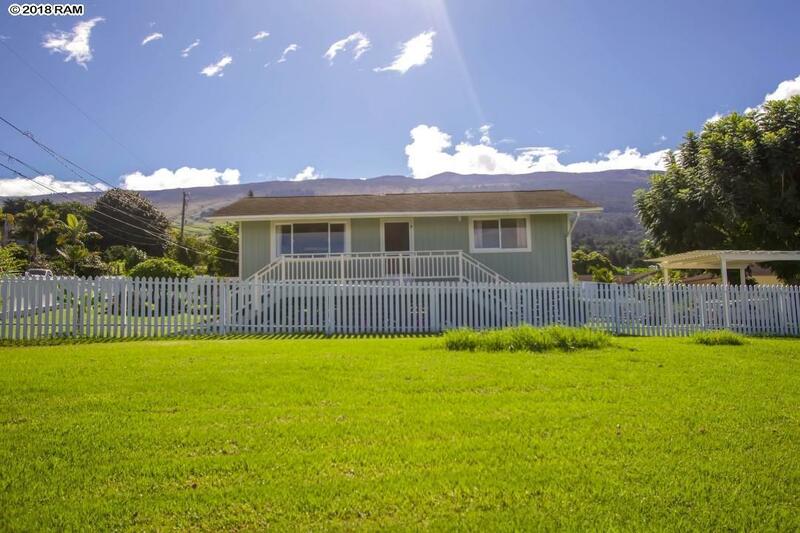 Down a private road in rural Kula, you will find an adorable 2 bedroom/ one bath cottage on a CPR'd 6700 sq. ft. of land. Known for the cool climate, Kula is the perfect blend of cool days and cold nights for comfortable living . A white picket fence encloses the yard allowing for privacy and beautiful views to the valley below. Enjoy afternoons under the pergola and evenings under the stars in the yard shaded by a large jacaranda tree. The cottage has wood laminate flooring with an open floor plan which creates options when arranging your living space. The back lanai runs the length of the living area and offers a great place to enjoy your morning coffee. This home has been carefully maintained by the current owners. A recent coat of paint on the interior and the exterior of the cottage freshen the home. An owned photo voltaic system will keep your electric bill down and the sub meter to the shared water meter will keep track of water usage. There is an upper gate adjacent to the road which allows cars to be parked close to the cottage at night. Call to view this Kula Cottage today! No sign on the property.